The HarperFamilyTree.com website has been really effective for getting in contact with other Harpers and their descendants around Australia who we wouldn’t have otherwise known or perhaps even known about. The first significant contact was from Maurie Harper. He had been researching for many years but there were questions around what had become of his Grandfather, William James Harper after he became estranged from his wife (Annie Maria Harper). Maurie was fairly sure he knew that William James had changed his name to Wilfred, so when I started researching our side of the family, which only ever knew William as Wilfred, we were able to put the pieces together and confirm what we both suspected. 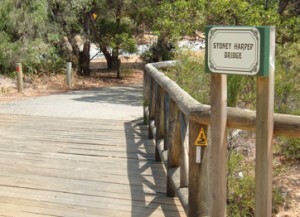 My name is Alan Harper and I live in Little Grove, Albany and am the son of Sydney Harper, whom Sydney Harper Bridge is named after as he was the pioneer of Little Grove having purchased the town site of Little Grove in the mid 1950’s. The John (Jack) Harper you mentioned was Allan Harper’s brother. They both travelled to WA in the early 1900s with their father John Philip Harper and were saw millers at Barrabup, near Nannup. Allan Harper married and stayed in WA, his brother and father returned to Victoria. Allan Harper was granted the first Sheoak milling license from the WA government based in Albany and our branch of the family has stayed here ever since. My grandfather was Allan James Harper. His father was John Philip Harper and his father was Andrew Harper. Andrew Harper who arrived in Port Philip Bay in 1841, married to Maria Gleghorn. If you are a descendant of any of the Harper or Trew families please feel free to contact me using the comments form. Hi all, My name is Laurence Hickie from Nottingham England, im trying to trace the Harper family who left Nottingham for Australia in the 70s. The Family consisted of Mr & Mrs Roy Harper and children Roy (junior) Sharon & a younger brother. Roy junior an old school friend from Beeston Rylands Nottingham must be in his early 50s. Can Anybody Help Me Get In Touch. Robyn Harper, I am a great-grandson of James Harper and Edith May Round. I have photos of them, and I met James once as a child, in his nursing home. Email me at rhysh@webone.com.au if you would like to correspond. Note that this website has Edith May Round with the surname Horkings. Perhaps that was a married name. Her maiden name was definitely Round, and I have photos of her (Round!) parents; George Round drove the Outer Circle train. Hi, I am the great granddaughter of Martin Thomas Harper, (11th child of Hanorah Ryan and Samuel Harper) and Mary Francis Norris. I would love to get in touch with any other descendants of Martin Thomas. I also have done a bit of research on Martin and can fill in some of the details of his marriage and death. Thanks. Holly. Hi Holly. Martin Thomas Harper was my grandfather. He passed away when I was 3. My father is Thomas Valentine Harper dec 2003. I only every met his mother Mary Norris, whom I used to call grandma Harper. I only met my fathers twin sisters, Molly and Kitty which I believe is short for Elizabeth. He also had 2 brothers, Stanislaus and Desmond. I never me either of them, in fact I didnt know they existed til I was in my teens. I think there was some family fallout along the way with them and my father. I didnt know much about my family history on my fathers side until looking up this website on Tuesday. It is great. Would love to hear from you.